Dealing with stinging insects on your own could end badly and be ineffective – call us instead! 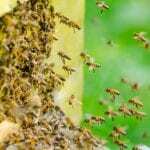 Stinging insects cause anxiety in just about everyone, but especially in those with severe allergic reactions to stings. As a Miami, Florida homeowner, you could also be anxious because of the damage that they can cause to your home. Carpenter bees cause direct damage to wood when they drill in circular holes and tunnels to make a place to lay their eggs. While they aren’t as damaging as termites, they can undermine structural integrity, leave an unsightly mess, and leave your woodwork susceptible to moisture intrusion, resulting in rot and decay. 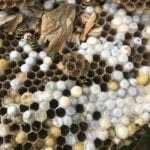 These bees have also been known to damage outdoor furniture in addition to rafters, decks, fascia boards, eaves, and other wood aspects of a home. Whether you are concerned about carpenter bees, honey bees, bumblebees, yellow jackets, hornets, or any other type of stinging insects, your best solution is to call us at Florida Bee Removal. We fully understand the anxiety involved with stinging insects and offer around-the-clock response so even an emergency situation can be dealt with timely and effectively. We recommend turning your stinging insect problem over to a professional rather than employing DIY measures because using the wrong product can be a safety concern and prove ineffective. We have decades of experience and we regularly attend seminars and workshops to stay on top of developments in the industry. We handle stinging insects in a safe manner and can provide you with advice about how to avoid new colonies from forming. Call us today to arrange for a free inspection to determine the extent of the problem and receive information about how to resolve it.